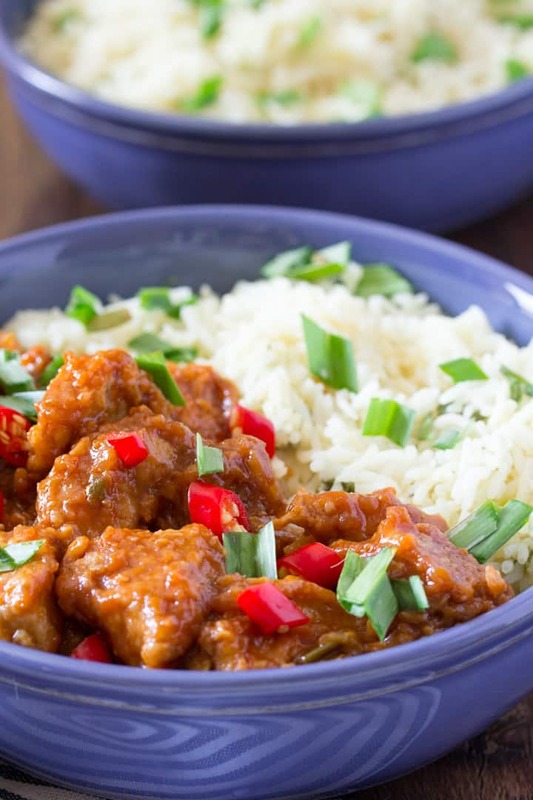 Chicken Manchurian Recipe is a delicious and one of the most popular Indo Chinese recipes that is made with chicken (and sometimes with vegetables such as gobi manchurian). 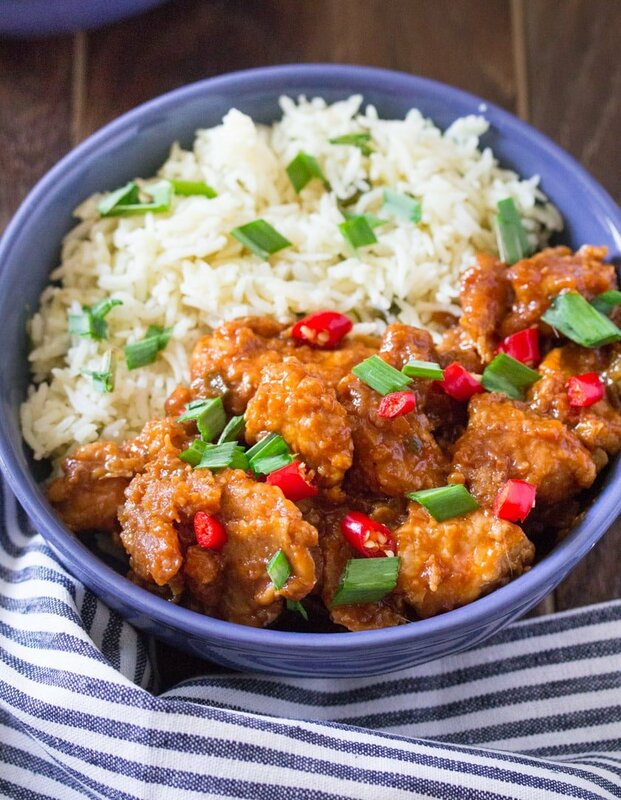 Read onto learn how to make Chicken Manchurian recipe, what goes into Manchurian sauce and lots of other neat tips & tricks to make this popular indo chinese recipe at home. Hi everyone! I’m here with a super delicious and easy version of Chicken Manchurian Recipe, which is very popular in restaurants back home. Is Chicken Manchurian a Chinese Dish? Chicken Manchurian consists of crispy coated boneless chicken pieces served in a spicy, tangy brown or red sauce. It’s an indo chinese recipe popular in Indian & Pakistani restaurants, and bears little resemblance to Manchu or Chinese cuisine. What is in Manchurian Sauce? Manchurian sauce is made up from ketchup, soy sauce and sometimes chilli garlic sauce. It’s always garnished with green onions. And it’s always super delicious 😀 sometimes capsicum (green bell pepper) is sometimes used, but authentic chicken manchurian sauce doesn’t havee any. Manchurian sauce is tangy and sweet, and its important to get the balance of flavours right. In restaurants its typically served as a bright red sauce (often tinted with red food colouring) but as you can see in the pictures here, I did not add food colouring. If you want to, you may do so. How do you make Chicken Manchurian Recipe? First you start by making a batter for the chicken – mix corn flour, flour, salt, pepper and one egg to make the better. We also add soy sauce and ginger garlic paste to the batter. Dip boneless pieces of chicken into it and then deep fry until golden crispy – who needs gold when you can have these golden nuggets of yumminess? LOL. The manchurian sauce is primarily made from ketchup, chilli garlic sauce (optional), soy sauce, and a little bit of chopped green onions. You may also add cubed onions and green capsicum (bell pepper) but I usually don’t add either. Although the most popular version is this Chicken Manchurian recipe, there are other variations on this famous indo chinese recipe. 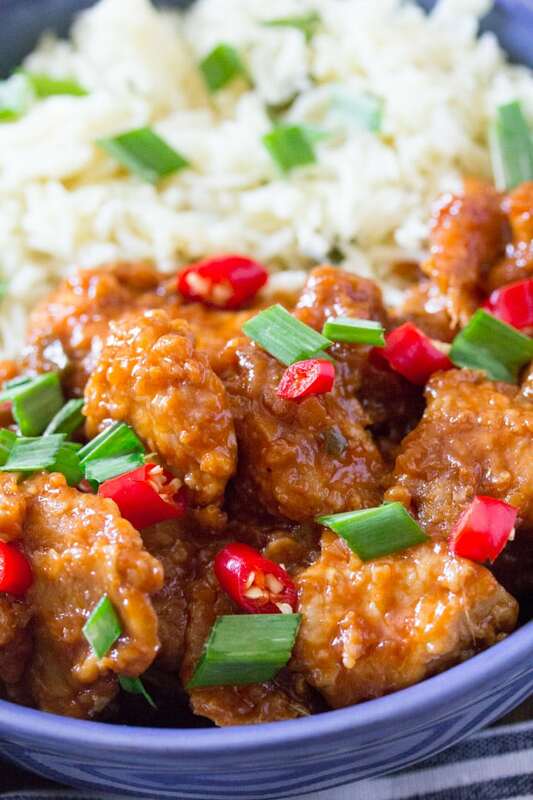 Other popular variations include recipes such as gobi manchurian which is cauliflower florets dipped into the batter and then deep fried and coated with the manchurian sauce. Manchurian is also made with paneer (cottage cheese), fish, prawns or even mutton. I do hope you try this super delicious and easy recipe. Not much chopping involved, and that’s exactly the way I like it! Serve this Chicken Manchurian Recipe with garlic butter rice (coming to the blog soon!) or egg fried rice. Combine all the batter ingredients and mix well. Add the chicken boneless pieces and coat well. Fry the chicken boneless pieces until golden brown and cooked through. Transfer to kitchen paper to drain excess oil. Set aside. Heat oil in a wok, and add the garlic and ginger and fry for about 30 seconds. Then add the green onions and fry for another 30 seconds. Add all sauce ingredients except the cornstarch and water. Cook for a minute or two until the sauce starts to thicken and bubble. Dissolve the cornstarch in the water and add it to the sauce and keep stirring until it becomes thick. Toss in the fried chicken and mix so that the sauce coats the chicken well. Serve with garlic butter (pictured) or egg fried rice. Just finished dinner and we all loved it ! Really a wonderful recipe, easy, quick and delicious ! Oh wow! That coating and sauce looks incredible. And it comes together so easily! I’m sure my family will love it. So I order this dish at my favorite indian restaurant called chicken chili that I am in love with – I’m pretty sure this is the recipe fro that! I’m so excited to try it out because I love that stuff! 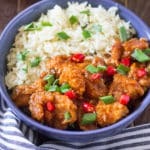 I am always looking for some great chicken recipes like this one it sure looks amazing! Going to Print it off to try! This just looks amazing like something you would get at a nice restaurant. Can’t wait to try to make it for myself! I love this recipe! The sauce is right up my ally and I don’t like to add onions and peppers to this type of recipe either! I’ll be making this asap! This dish sounds so delicious! Never heard of Manchurian before, but the combination of flavours really sound absolutely yummy! We love manchuria and your version looks and sounds so inviting and tempting. Perfect side dish to serve with some fried rice or noodle — yummy!! This looks like a delicious recipe. I love trying new foods…and when you can make this at home….who need takeout?? I would love having leftovers for lunch too. Your Chicken Manchurian is a winner. Easy and delicious, a perfect meal that my family loves to eat! This is a way better way to enjoy dinner than ordering out and also super cost effective. On my families weekly meal rotation. What a great looking recipe!! I love trying new recipes and new methods of preparing the ingredients. We eat lots of chicken and we certainly like spicy foods. This would be a dish that we’d thoroughly enjoy. This looks so flavorful and delicious. I’ve never tried Manchurian Sauce but now you got me really interested. This is something tham my family would love to have for dinner. Must try this. Something new to add to the menu plan! Fried chicken just seems to love sauces on it, so I know this has to be good! I’m always intrigued by fusion-type dishes like this – so often they have a ton of flavor and are easy to make and this definitely looks to be just that. The pictures make it look so good! Mmm, looks like this came out just right! What great vibrant colors — wonderful photography as well as cooking! I’ve never tried Chicken Manchurian, but I love coated boneless chicken. This looks so so good! Yum! I have never had Chicken Manchurian, but I love that you did not add any artificial coloring! It’s pretty as is, and much healthier too! 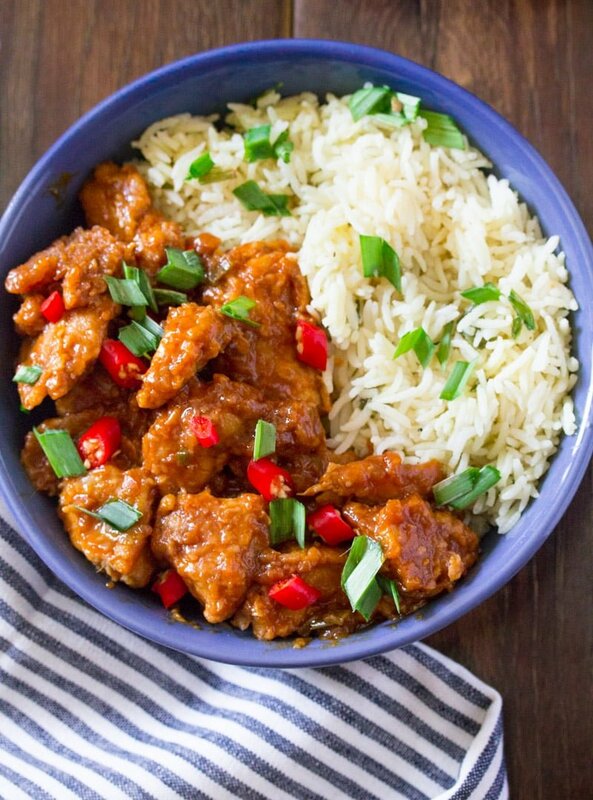 Chicken and rice are so perfect together, even in different cuisines. This dish looks as good as some of the dishes I’ve seen in restaurants. 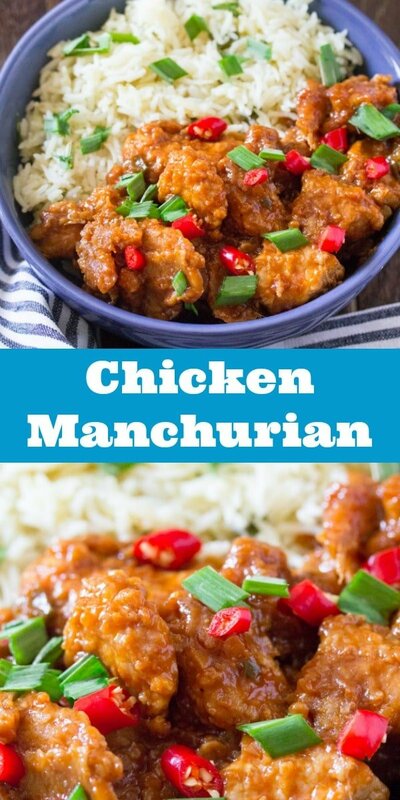 I’ve never had Chicken Manchurian before but it looks mouthwatering and that sauce sounds amazing! It’s recipes like this that will put fast food out of business – quick, easy and delicious! YUM! I’ve never heard of this before, but it sounds delicious! omg this looks absolutely superb!! I love the idea of the crispy chicken as well, totally drool worthy! Holy Yum! This looks so yummy! I have never tried this type of sauce before and can’t wait to add this to the dinner line-up! Pinned, thanks so much for the recipe! We love Asian inspired dishes, and this would be no different. This sauce sounds so sweet and tangy, I know we will love this one. what a hearty dish with such delicious flavors everyone here will love this is a must try! I love chicken Manchurian and this looks perfect. Reminds me of India, my kids love this. Always a big hit in our home. Saving this for later. I really like the idea of coating the chicken first so that it will be crispy. That way the sauce will adhere to the chicken better. My mouth is watering looking at the scrumptious dish. We love spicy and I would not add red food coloring — it doesn’t do anything for the taste and I prefer everything to be natural. yessss! This is the perfect recipe for me. Looks VERY tasty! Now, this recipe will be one of my favorites. Looks incredible! I would love to have this for dinner. My family loves going out to eat and this is one of their favorites now I can make it! I’ve never heard of Chicken Manchurian before, but just seeing those spices I already know it’s something I will love! “who needs gold when you can have these golden nuggets of yumminess” My thought exactly! I love anything fried and I really enjoy coating them in a yummy sticky sauce. I just pinned this to try later. Manchurian is my favorite flavor profile from the cuisine. This sounds spicy and inviting.